My furry mutt is the love of my life. It’s not always easy for me to take her with me on my travels, yet I try to stay at properties that are “pet friendly” whenever possible. I get out and explores the scenery more while walking my dog. It’s also a great ice-breaker to talk to guests at the hotel or residents in a community when out walking your dog. You are bound to stop when you approach another dog and owner with a smile. While the furry friends are getting to know each other, it’s a good time to for travelers to ask about favorite restaurants, dog-friendly parks, and favorite walking trails. 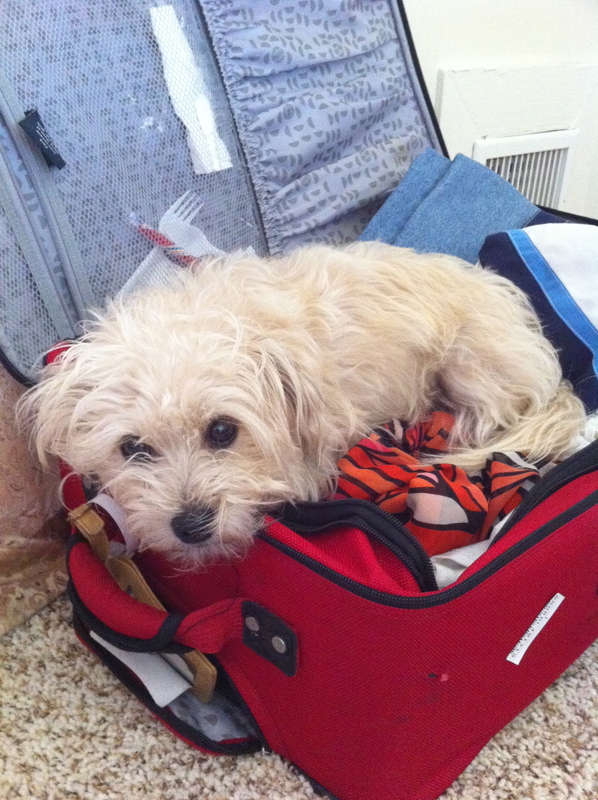 If your dog meets the following requirements, then he or she can travel with you too. Dogs must be quiet, leashed, cleaned up after, and crated when left alone in the room. W Los Angeles – Westwood has a special Pets are Welcome program for cats and dogs that are 40 pounds or less. Upon arrival, guests and their four-legged friends receive a special welcome amenity, information about the pet services available through the Concierge, custom W pet bed, food and water bowl for floor mat, pet in-room door sign, and a special treat at Turndown. The fee is $25 above the daily room charge, plus a non-refundable $100 cleaning fee. Inn at Laguna Beach is the only hotel right next to the beach and charming town to offer your pooch room and board and dog walking. Wonderful paved walking paths and grassy parks are steps outside this property. Ginger and I enjoy waking up in the morning and evening to Heisler Park. It’s just north of Main Beach. Heisler Park offers spectacular views of the Laguna Beach coastline. We take a half-mile stroll along the paved path and meet new friends relaxing for a picnic on the grass or waiting for a handout while their owners are barbecuing with friends. I bring Ginger’s bed, food and water bowls and treats. If you would like the Pampered Pooch package it’s $75 per dog, per night and can be added onto any room rate. The package includes a comfortable dog bed, dog bowl and toy for use during stay. They offer a doggie treat each evening at turndown. If you choose, a licensed dog walking service will walk your dog on a 15-minute walk. The Inn will allow two dogs under 40 pounds per room. However, they are not fans of pit bulls or pit mixes. You must complete a pet waiver upon check-in. 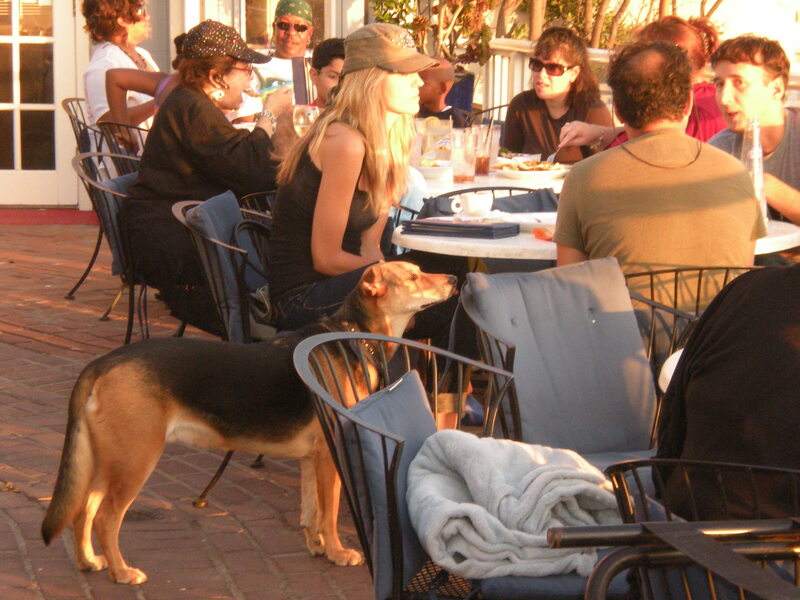 The Cliff restaurant within walking distance of the Inn at Laguna Beach allows well behaved dogs to join their owners outside – (949)494-1956. 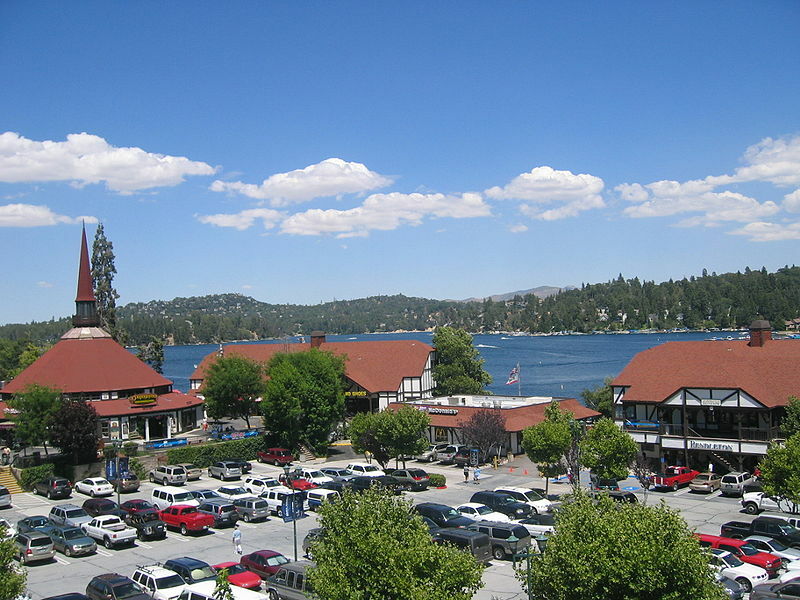 The Inn at Laguna Beach is located at 211 N. Coast Hwy. 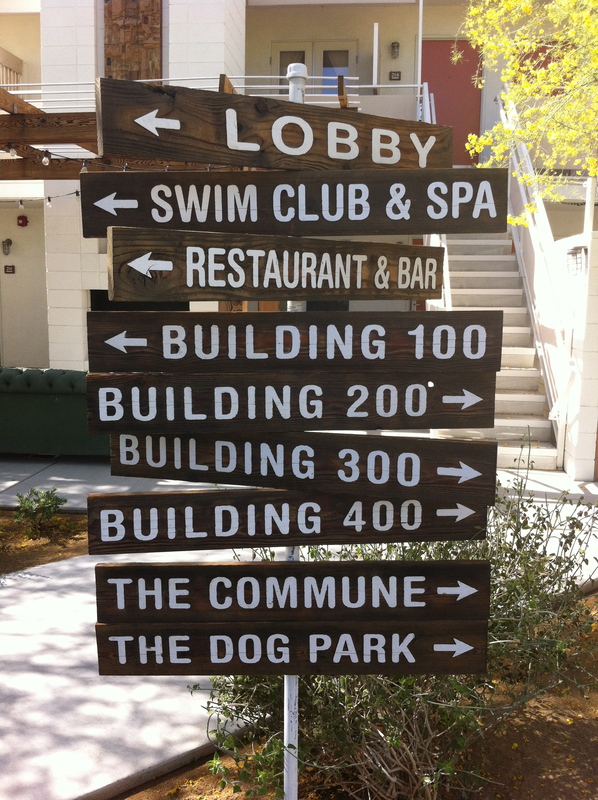 Ace Hotel and Swim Club loves animals. They have a dog friendly park where Ginger can run around and do her business. She loves to sit with me when I hang out by the pool. She is not allowed in, but that’s ok, because she doesn’t like to swim anyways. 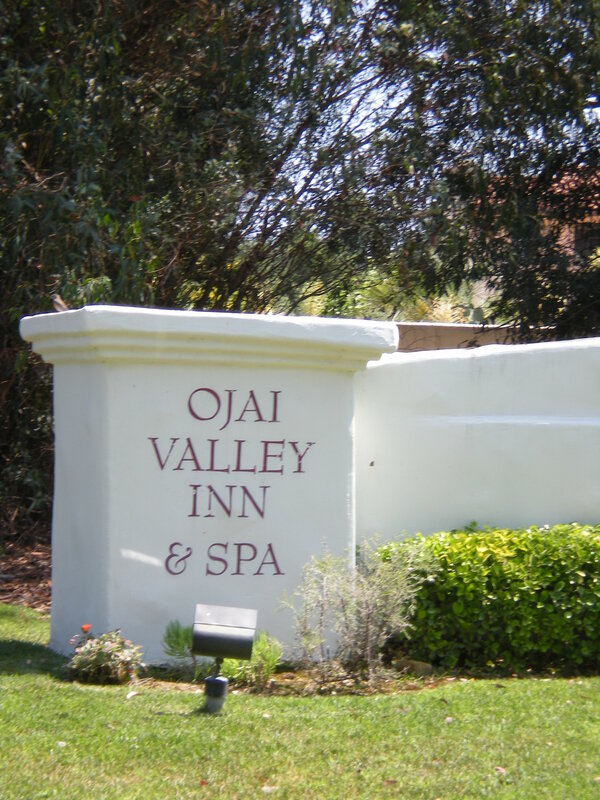 The outdoor patio fireplace and patio garden rooms are pet friendly. The fee is $25 per day for the first pet and $10 for each additional pet. It’s close enough to walk to shops along Palm Canyon where Ginger finds many water bowls to quench her thirst. During the summer it does get quite warm, up to 115 degrees. Ginger and I like to visit the desert in Oct. to May for optimal temperatures for hiking, walking and sitting outside to enjoy the dry warm air. 701 E Palm Canyon Dr, Palm Springs – (760) 325-9900. Ginger just makes the maximum weight requirement to stay at Paradise Point right on the bay. They offer a Petite Pooch program where I must sign a pet policy upon check in. I must agree that Ginger weighs less than 15 lbs. Since she is the sweetest little pooch, I don’t have to worry about the not aggressive clause. I always bring her current vaccination sheet. She also must be free of ticks and fleas. 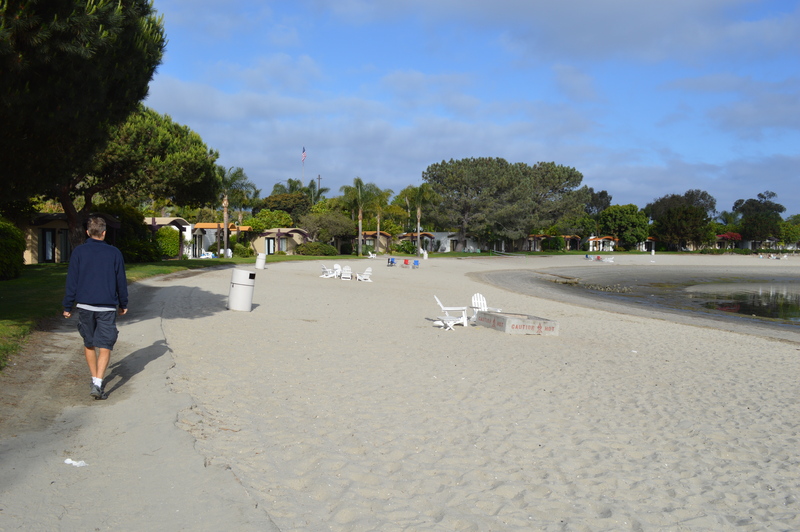 Paradise Pointe has a great beach to explore with your pooch. She is always under my control anytime we are outside of the room in the lobby, public areas, and guestrooms. Ginger is not allowed at Baleen, Barefoot Bar & Grill, Tropics, the resort pools, Spa or Island Market. If Ginger ever had an accident I would have to pay an additional $150 cleaning fee. The Pet Fee is $250 per stay, to be paid in advance to the Resort, however $150 is refunded upon our departure, pending inspection of the guest room, once they see that Ginger is a very well behaved pup. 1404 Vacation Road •San Diego, CA 92109 •Phone: 858.274.4630 •Reservations: 800.344.2626 www.paradisepoint.com. Dogs aren’t allowed to swim at the glorious Bacara pool, but they can in the nearby Pacific Ocean. to explore. Housekeeping left clean up bags for her. It did cost $150 for a one-time non-refundable pet fee. She sat with her dog outside at the Bistro Restaurant terrace to dine together. It offered a casual and relaxed atmosphere to dine and enjoy sweeping views of the coastline. The locally-sourced ingredients offer an Italian flair. They also could sit together in the healthy dining option, Spa Café. the numerous pet-friendly amenities already offered by the hotel. The new Canine Cuisine menu offers a range of mouth-watering entrées for Fido and friends, including a deboned rotisserie chicken, chopped juicy beef and bacon burger, chopped meatloaf shepherd’s pie and a mixed vegetable burger with rice and potatoes. Each gourmet dish is freshly prepared by chefs at the hotel’s Bistro West restaurant and features farm-fresh ingredients from the property’s own 3-acre farm. Each dish is also offered in various portion sizes to accommodate the appetites of all sized pooches. Upon arrival at the West Inn & Suites, four-legged friends are treated with the highest level of customer service. Pets are welcomed with a special treat at check in and their names are displayed on the welcome chalk board at the front desk. Inside their rooms, pets can expect to find numerous amenities and delights. Treats and pet aromatherapy sprays are available to help Fido ease into vacation, while dog bowls and doggie beds are specifically sized per pet to offer the ultimate in comfort and relaxation. For the adventurous pup, the hotel’s Pet Concierge can suggest an abundance of local pet-friendly activities ranging from local dog beaches to the best day care facilities while visiting LEGOLAND for the day. The hotel also has a pet-friendly patio at adjacent Bistro West restaurant and has and onsite dog park with a pet drinking fountain for refreshment after playtime. West Inn & Suites will offer a special introductory package for guests traveling with pets, starting at $209 per night, plus tax. The package includes deluxe accommodations, choice of one Canine Cuisine entrée, use of the hotel’s pet park and pet concierge, preferred pet-friendly seating on the Bistro West patio and daily in-room cleaning and placement of pet beds, bowls, treats and amenities. 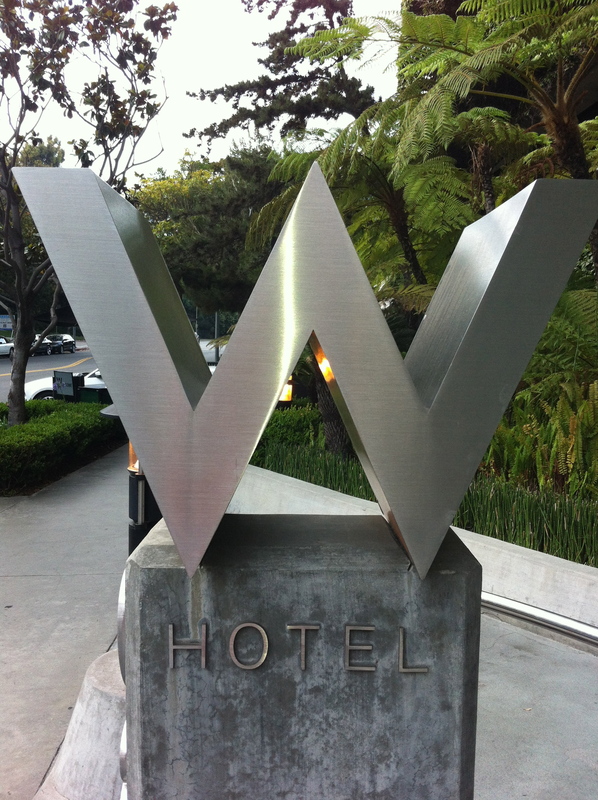 For reservations, visit www.westinnandsuites.com or call (760) 448-4500.